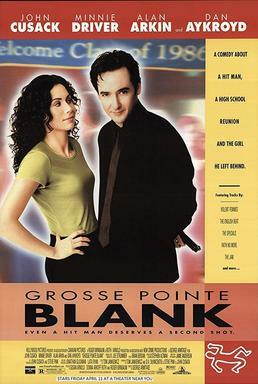 There is something intrinsically weird about Grosse Point Blank as a movie, and I think that's why it's wonderful. It was made during the second renaissance of John Cusack, where he did High Fidelity and Grosse Point Blank almost back to back, both of which were projects that absolutely sailed, and for highly different reasons. We need to get this John Cusack back, the one who knows how to pick the smart projects. The premise of the film is surreal to start with. A hitman is invited to his ten year high school reunion. Coincidentally enough, he also has a job there. And, on top of everything, he's dealing with an impeding assassins union struggle (no, really) and his therapist won't return his phone calls. The guy's a mess, but then again, who isn't around the time of their ten year high school reunion? I didn't go to mine, because I wasn't invited, but my twenty year is coming up next year, and I'll probably go to that, and I expect it to be as strange and unusual as the one Cusack's character goes to here. (One of the lines in the movie is "It was like everyone had swelled.") But before he gets to the reunion, he's going to try and reconnect with his past - the best friend he left behind, the girl he left on prom night, the house he grew up in. Needless to say, none of this goes as planned. Yesterday I was talking about ensemble casts, and Grosse Point Blank really is an embarrassment of riches in this regard. Dan Aykroyd plays the guy trying to talk Cusack into joining his little assassin's union, Alan Arkin is Cusack's reluctant therapist, Jeremy Pivens is the best friend who's trying to figure out what the hell is going on and Minnie Driver is the girl he left behind. Oh, and John's sister Joan is his assistant/partner-in-crime. Hell, even Hank Azaria's in the movie. The film is filled with crackling dialogue and wonderful fish-out-of-water moments made even funnier by the fact that it's an assassin in suburbia. HIS suburbia, rather, or the one he grew up in. But while he's been gone for ten years, his hometown has changed, and more than he'd expected, from the girl he left behind (who's a radio DJ now) to the house he grew up in. 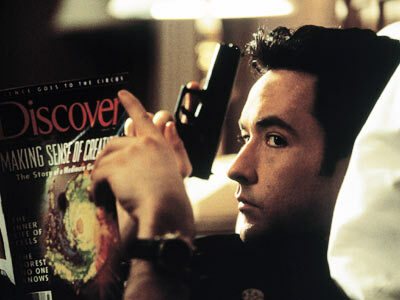 Grosse Point Blank is also flush with the best possible 1986 soundtrack you could put together, from the mainstream stuff like a-ha's "Take On Me" to the popular but somewhat indie stuff such as Echo & The Bunnymen's "The Killing Moon" or Faith No More's "We Care A Lot." The music for the film was so good they put out not one, but two soundtracks to it. The star of the show is John Cusack, though, who plays the man adrift better than I even thought possible. This is a guy who's been trying to find himself for the last few years, after having lived a life doing some pretty bad things and telling himself he was doing it for the right reasons. He goes through so many different phases in this movie, it's kind of remarkable to watch, even as he's trying to see whether or not he can blend in with the life he left behind. He gets to play: frantic, subdued, tortured, ecstatic, nervous... in fact, it's a little like high school all over again. There's also an amazing thirty second scene where he's interacting with a baby, and it's almost like a capsule of the entire movie told purely through facial expressions.